Washington (CNN) - Supporters of South Carolina Sen. Jim DeMint are quietly organizing a Republican presidential forum slated for sometime around Labor Day, Republican sources confirm to CNN. The event would be more of a question-and-answer session rather than a debate. Candidates will be asked to offer concrete plans for fixing the debt and growing the economy, according to one person involved in the planning. "It is an effort to band together and put people through a real interview-type process," the source told CNN. "I can't take another candidate who says he or she is for limited government and then doesn't do anything about it. We want to know your plan. This is about getting real, and not throwing out a bunch of 30-second sound bites." DeMint has given his blessing to the plan and will participate in the forum, South Carolina Republicans said. News of the event was first reported Friday by Roll Call. DeMint has ruled out a presidential bid of his own, disappointing several of his top South Carolina backers who say the 2012 presidential field lacks a credible voice on the topics of spending and the debt. About a half dozen DeMint supporters have taken to calling themselves the "Keep Your Powder Dry Caucus" in recent weeks, with the goal of remaining neutral through the early part of the primary process before putting their collective muscle behind one candidate at some point after the forum. 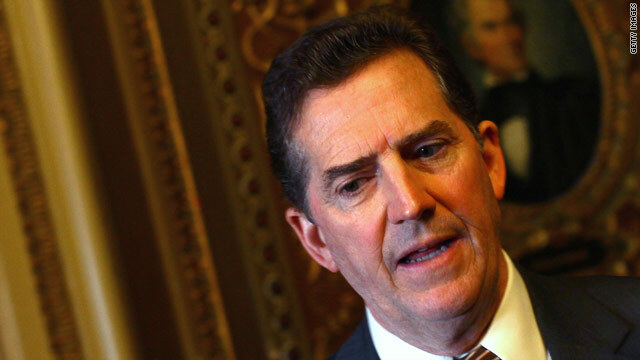 "In my mind, if DeMint is not going to run, he has got to have a part in the process of determining who we are going to pick," one supporter told CNN. Because when polls do not favor the Republicans, they do not believe it is because the people disagree or dislike their ideas and opinions. To Republicans, it is a messaging problem. That the American people are not listening to what they are being told to think. Yes, it is all about messaging to Republicans. And I give them credit for the ingenuity in which they do it. They take advantage of people's pysche. People like to believe that their ideas and opinions are the correct ones, but more importantly that their feelings are part of the majority. So, you hear phrases like, "The will of the American people...," or "Most Americans feel...." And, so on. These phrases are always coming from Republican leaders in Congress. Just this week we heard both McConnell and Boehner use similar phrasing to describe how "Americans do not want higher taxes" when all polls show an overwhelming majority do want to raise taxes, even including most Republicans polled. When people hear those phrases enough times, their opinions change. Self doubt creeps in. People do not want to feel that they are part of the losing side, that they are wrong. Many people fall victim to this type of subliminal messaging. Take notice people. Listen for those phrases. so you mean that they don't all just stand there and bash President Obama while not offering any type of solutions of their own? OMG these guys may not know what to do in this case. The Greedy Old Pigs have turned into an angry cult! This is a not very well veiled threat to keep all the GOBPbaggin' cultists from moderating their extremists views and reversing the tax cuts for the filthy rich. The radical rightwing extremists are going to the mat on this one, and for average sane Americans who are paying attention, the mask is off. The crazy teatard cultists on the far right are either true believers or simply Koch-wh0res eager to serve their billionaire corporate masters/welfare queens at the country's expense. Yeah right. 30 second sound bites. That's what the GOP is for. Blame without offering any solution. Obama is way better that any of these retublicans. One more loon for the GOP mix. Another Right-Wing extremist fruit loop that claims to hear voices in his head sent by God. What's the point? I don't get it. We already have a ton of rightie extremist candidates...as if there is any difference? "A question-and-answer session rather than a debate. Candidates will be asked to offer concrete plans for fixing the debt and growing the economy - an effort to band together and put people through a real interview-type process - we want to know your plan"
That's what a DEBATE IS SUPPOSE TO BE. If these "moderators" would do their jobs and probe a bit deeper instead of allowing sound bites a debate might have some value. Most people in South Carolina have no idea what DeMint does as our senator. He seems to enjoy playing politics a lot more than working for us. He's an obstructionist who has never governed anything. It's always easier to criticize than actually lead. Fascism is an authoritarian form of government opposed to extending civil liberties (and even curtailing or removing existing ones) in exchange for radical empowerment of business and economy. >>>>>>> (Look at all the laws currently put in place to restrict women's rights and voter's rights). Fascist countries usually have elite armies, and see war as a sport or honour event. Lax views on imperialism, a holier-than-thou immigration discrimination policies (first generation immigrants to work for half minimum wage), and everything 'for the state'. >>>>>>> (All the anti-LEGAL immigration things being said). The HELL NO CAUCUS is losing credbility with each passing day. Good Lord! What person in their right mind would want those nutjob extremists dictating our morals to us while they bang every bimbo they can get their hands on? "Forty-four percent of registered voters say they are more likely to vote for "the Republican Party's candidate" and 39% for Barack Obama in the 2012 presidential election, according to Gallup's June update. " Sorry dims but the Fat Lady is warming up her vocal chords. South Carolina: To small to be a country and too large to be a nut house or funny farm! Where do the politicians from SC come from? Are these the old plantation and slave owners of the civil war that have been reincarnated? Why would any candidate of either party want to be questioned by these lunatics? Beer is Good, and People are Crazy"!! !